After a week of unusually intense rain showers and hail I set out to discover LA mycological specimen. From the spongy and slimey, to the statuesque and colorful, LA does have quite a variety! Most had sprouted above the ground within the last two days, with the oldest being about seven days in age. Unfortunately, 75% of the mushrooms found were poisenous, distasteful, rotten with maggots, or eaten by snails. Nevertheless, people in the U.S. are becoming increasingly aware of and interested in learning more about mushrooms… maybe it’s some combination of the economy, sustainability interests, change in values and life styles, delicacy, and medicinal uses (which are so common in Asian pharmacies). 4.2 million years ago many new fungi species flourished during this active time. Fungi’s bizarre cylindrical forms became a prominent element of the terrestrial landscape and some grew as tall as twenty-four feet (see Prehistoric mystery organism verified as giant fungus, University of Chicago News Office). Humans have an intrinsic fascination with the dominant life forms—such as dinosaurs or giant mammals—but here was a landscape dominated by a goliath organism: the giant fungi. These fungi were titans stretching themselves toward the sky and held the stature of trees. 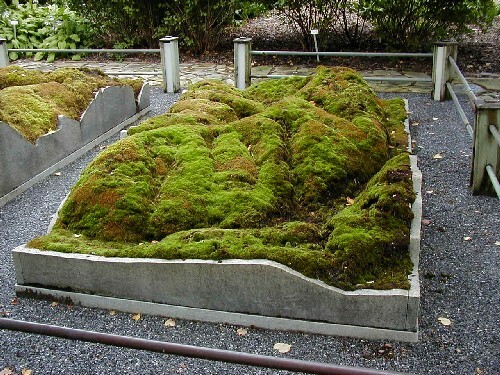 The moss collecting hobby in the late 19th Century led to the establishment of mosseries in British and American gardens. For a dynamite mossery, see http://…/dsmoss.jpg. While the images here were taken in the forest behind my backyard in Maine, the following is a recipe for growing moss and some related thoughts on green art. In 2008, Maine had an unusually high amount of forest mushrooms (described by local residents). While joining the University of Maine faculty during the fall semester I dedicated extensive time observing and documenting the forests surrounding campus. Maine’s forests brought back memories: when I was a kid in Germany my parents took me on long hikes through the Black Forest. The composting floors–fertile with moist leaves, ferns, twigs, logs, and saturated moss patches–smelled of wild mushrooms. The sensory connections between past and present were fantastic.